(Toronto, September 27, 2017) The world’s largest companies are under-reporting sustainability policies and performance, hampering investors’ access to data that will allow them to play a full role in the transition to a low-carbon economy, according to a new report released today. The study, Measuring Sustainability Disclosure: Ranking the World’s Stock Exchanges 2017, finds that of 6,441 large companies analysed, 78% disclosed payroll followed by greenhouse gases (43%) energy (40%), water (38%), waste (29%), injuries (24%) and employee turnover (15%). Over the past five years, corporate disclosure rates for GHGs, energy and waste and injuries have flat-lined while water and employee disclosure both improved at an annualized clip of 10%. First commissioned by Aviva Plc in 2012 as part of the Sustainable Stock Exchange Initiative, the report tracks corporate disclosure on seven sustainability indicators. 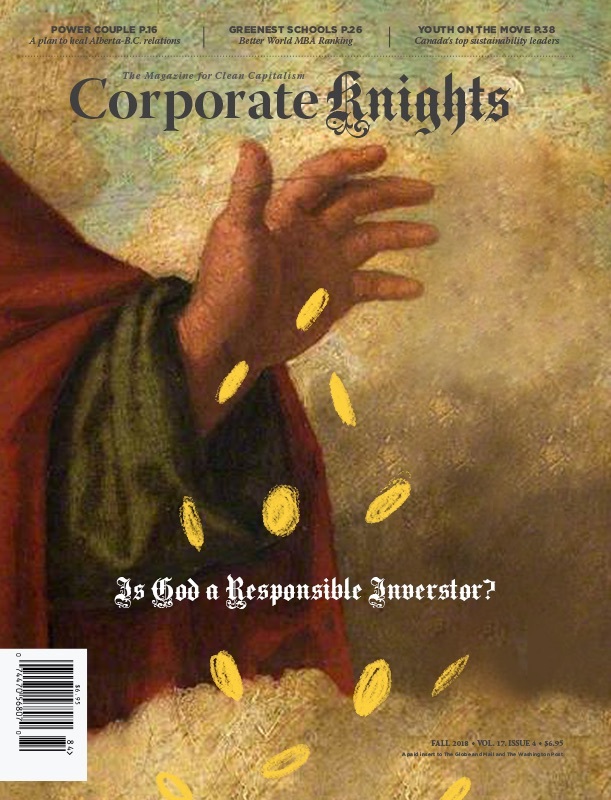 Written by Corporate Knights, it also suggests how such disclosure can be translated into actionable key performance indicators, which might help investors to distinguish companies that are incorporating sustainability into their value creation story. In the short-term, exchanges and regulators should set a mandatory requirement for climate disclosure (building on the recommendations in the recent Financial Stability Report report of the Taskforce on Climate-related Financial Disclosures) on a “comply or explain” basis, which can help maintain clear expectations while allowing companies the flexibility they need. The Helsinki Stock Exchange was the world’s best performing exchange when it came to disclosure of sustainability metrics. Over 50 per cent of its large listings disclosed all four environmental metrics – GHGs, energy, water and waste. Stock exchanges in European developed countries dominated the top 10 rankings, with the exception of the Australian Securities Exchange, Johannesburg Stock Exchange, and Stock Exchange of Thailand, which progressed from 40th place in the 2013 rankings to 10th place in this year’s ranking. The combination of voluntary reporting guidelines issued by the stock exchange in 2012 followed by mandatory disclosure requirements by the securities regulator in 2014 appears to have contributed to the continuous rise of the Stock Exchange of Thailand in the ranking. The London Stock Exchange, which placed fourth in the ranking (up from 8th the previous year), saw 91 per cent of its large companies disclose GHGs, making it the exchange with the highest percentage of GHG disclosure among all stock exchanges surveyed. The UK’s 2013 update of the Companies Act Made GHG disclosure mandatory for listed UK incorporated companies. All of the top ten ranked stock exchanges have mandatory, prescriptive requirements for sustainability disclosure. The Copenhagen Stock Exchange was found to be the exchange with the highest proportion of revenue from environmentally sustainable sources, at 4.4%, while Oil-rich Norway’s Oslo Stock Exchange was found to be the exchange with the highest percentage of corporate revenue from brown sources – oil & gas, thermal coal and electric utilities that use coal for electricity generation (44.5%) – followed closely by the Moscow Exchange at 43.9%. The Warsaw Stock Exchange is the most carbon-intensive stock exchange of the 55 exchanges studied, with 1,674 metric tons of GHGs per million of revenue in U.S. dollars in 2015, while the tech-heavy Nasdaq was found to be the one with the lowest carbon intensity at 76 metric tons of GHGs per million of revenue. Click here to go back to the report landing page.